TEE Green high performance artificial grass carpet is an excellent choice for your home putting green with virtually no maintenance. This professional quality artificial grass is ideal for both indoor and outdoor putting greens providing a flawless and durable surface for your practice needs. Ever dreamed of having your very own championship golf course in your back yard? With a low pile height (18mm), our superior quality TEE Green artificial grass provides a smooth, consistent surface ensuring a true ball roll for your customised golf green. Our long lasting putting, chipping and target greens can be designed and installed to cover virtually any space. Contact us today for a free consultation. ✓ You’ll never have to leave the house again! 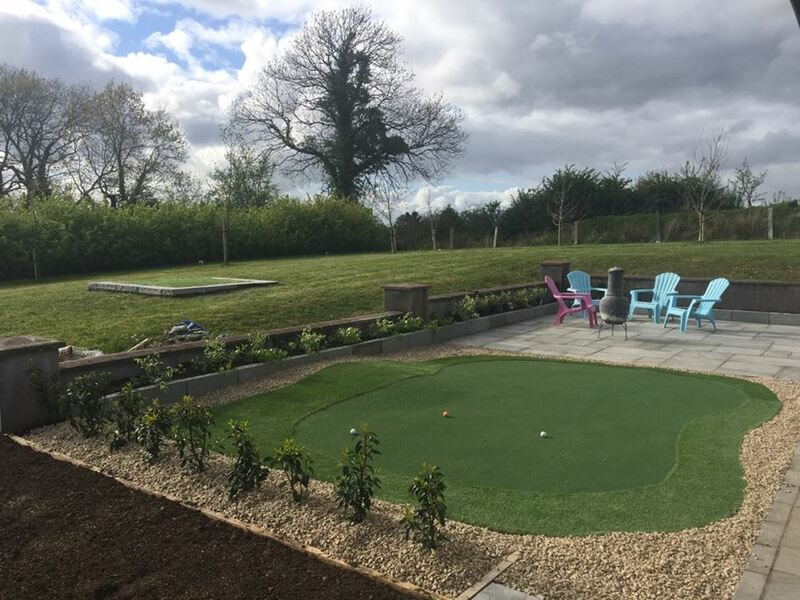 See below a customised putting green that we installed for a client in Laois. How much will TEE Green artificial grass cost? Our TEE Green artificial grass is €45 per m2 including VAT for grass only. If you want PST Lawns to install your home putting green for you contact us directly for a quote. Call Ruairí today LoCall: 1890 917 006 | Mobile: (087) 766 8045. Alternatively, email us at hello@PSTlawns.ie and one of our team will get back to you straight away.